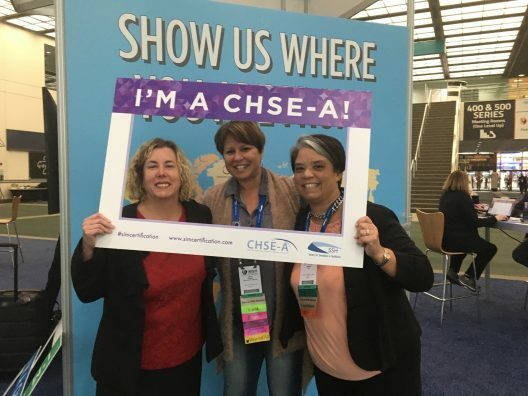 Nursing Professors Mindi Anderson, Laura Gonzalez and Desiree Díaz are among just 28 simulation educators worldwide who have earned advanced certification (CHSE-A) in the field. Professors Mindi Anderson, Desiree Díaz and Laura Gonzalez from the College of Nursing are among just 28 simulation educators worldwide who have earned advanced certification in the field. An educational leader, the College of Nursing has remained at the forefront of the health care simulation industry. In recent years, leveraging its location in Orlando at the epicenter for modeling, simulation and training, the college has recruited nationally renowned experts to its faculty and created the state’s first and only Health Care Simulation graduate program. One of the nation’s largest universities, UCF is recognized nationally for its innovation. At the College of Nursing, its faculty are actively engaged in research in the field of simulation and technology. Current funded projects include a patented new simulated patient, an interactive “game” to help older patients with cancer and a simulated learning experience to enhance nurses’ readiness to practice. The Certified Healthcare Simulation Educator-Advanced (CHSE-A) certification from the Society for Simulation in Healthcare is awarded to leaders in health care simulation who have demonstrated a high level of expertise. Individuals must already have a CHSE (Certified Health Care Simulation Educator) certification, which is awarded after passing a comprehensive exam demonstrating specialized knowledge, skills and abilities in simulation education, and submit a portfolio highlighting their research, applied work and accomplishments in the field. Of the more than 1,200 CHSE, only an elite group of 28 have earned an advanced certification. Anderson, an associate professor, and Díaz, an assistant professor, joined the faculty in 2015 and earned their advanced certification in 2014 and 2016, respectively. Gonzalez, director of simulation at the College of Nursing and a clinical associate professor, has been on faculty since 2011 and achieved her CHSE-A in February 2018.